Acton Park has a new asset: Two delightful Polish ladies (Gabriella and Maggie) who have taken over the Art Deco cafe - originally built in 1936 - which is now open every day. I talked to Gabriella today over a nice cup of cappuccino. She has lived in Acton for 12 years. "I have been eyeing the cafe in Acton Park for a long time and I'm very happy to be here, finally." Gabriella's charming Polish accent belies the fact that she has lived in the UK for longer than she has lived in Poland. 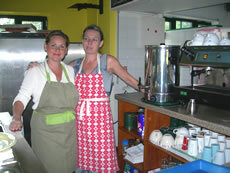 She is passionate about wanting to make a success of the cafe and has plans to give the place an overhaul. It already looks cared for, tidy and clean. My quick visit was enough to convince me that there is a much-needed injection of energy in the cafe which has been closed during the week for a long time. There are plans for special seasonal menus (Gabriella is a trained Cordon-Bleu chef who has been in the catering trade cooking for parties for many years) and on the menu for this weekend will be steamed chicken with peppers, a vegetarian pasta dish and crumble amongst other possibilities. Scrambled egg with smoked salmon and chives (£6) caught my eye but there is a good range of the traditional fry-up breakfasts which the cafe was known for in the past. 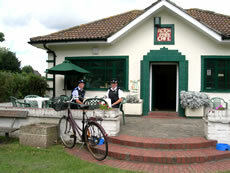 The Cafe also serves croissants and pastries supplied by Delices de France and ice cream by Di Sotto. Gabriella told me: "I have plans to change the look of the cafe: new tables, a change of colours inside and improvements to the terrace." 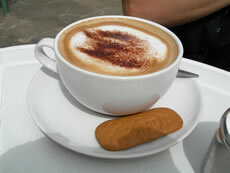 The Cafe is open long hours for the time being (8am until after 8pm) and welcomes comments from customers. Gabriella is enthusiastic about the challenge ahead: "I love to cook, but I realise I will have to start small and build the business up. I want to serve my customers sensible plain cooking. I love cooking Spanish food, too." The smiling faces of Gabriella and Maggie are a welcome addition to the Park scene.